Before you “poop your plants” LOL, learn these key handling and processing techniques to keep you and your plants free from contamination and sickness. Manure is a prime source of nitrogen, potassium, and phosphorus. It’s also rich in bacteria. For us home gardeners, applying fresh manure to an edible garden is not the wisest choice. The high probability that it will burn and dehydrate your plants becomes second fiddle to a bigger concern – nasty illnesses caused by pathogens like E. coli and salmonella. Poop “fresh off the press” should not be worked into the soil during the growing season. You’ve probably seen farmers applying it like there’s no tomorrow and wondered, “if they can do it, why not me?”. Most likely, farms spread it in the fall or use it to condition a field well before planting an edible crop. AT HOME, DON’T TAKE A CHANCE THAT YOU’LL EAT CONTAMINATED FOOD! One university study illustrated it with a simple drop of water. Imagine yourself watering your plants after working fresh manure into the soil. Picture a contaminated water droplet splashing up onto your vegetables. Now you’re playing Russian roulette with your health. Of course, washing your veggies will help. WHAT IS THE THREAT – STATISTICALLY SPEAKING? The Center for Disease Control and Prevention (CDC) published an article in 2005 that estimated the total number of E. coli illnesses in the United States annually. Can you guess the number? 5,000? 10,000? How about 73,000! And that is what is reported by medical facilities. There could be hundreds or even thousands more cases that were never treated officially. The same study broke down the causes of the outbreaks, and produce contamination was reported to be on the rise – more than 30% of all E. coli cases. Half of that was from cross contamination in restaurants. The other half was from produce already contaminated with E. coli. Lettuce, cabbage and sprouts are the most common carriers. It can happen at home too. Sadly, I read about a 2 year old boy in Maine who died from E. coli as a result of fresh manure added to the garden improperly. HOW DOES A CROP BECOME CONTAMINATED? There are several ways your food can get a “touch of the squirts”. Manure can contaminate irrigation and wash water as well as processing and storage equipment. Poor handling and shipping practices can also wreak havoc. The report from the CDC also warned that chlorine washes don’t reliably reduce E. coli counts. Gee. If this hasn’t convinced you not to put the stinky stuff next to your edibles, then I don’t know what will! 2. Know What’s In It! Pesticides, Antibiotics and Medications? Fly larvae are a big problem at some farms and so they spray pesticides on manure piles to kill the larvae. Another worry is that grass sprayed with herbicides can survive inside the animal’s body and eventually its manure. Chemicals can stick around in the manure and kill beneficial microbes. Do you know if the cows or horses were treated with drugs? Those drugs don’t kill all bacteria found in animal manure. Medications can also be present in manures. 3. Age Matters! Let Manure Sit Around and Act Lazy for a While. Fresh manure has a high level of acidity that can burn plants. Aging it properly not only reduces the inevitable shock factor to your plants but should kill the bad stuff that can make you sick. There are no guarantees. I cannot check your aged manure for pathogens. It is a fact that aging can reduce the risks. 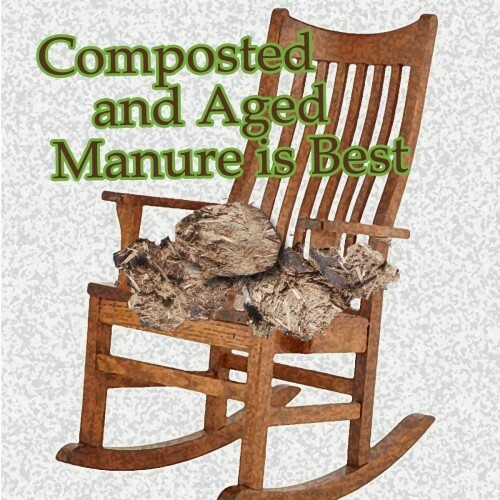 WHAT DOES IT MEAN TO “AGE” MANURE? Aged manure is powdery stuff that has been heat dried using temperatures at least 160°F for several hours at a minimum. The water content has been significantly reduced, e.g., 90% and it’s been exposed to air and the elements for at least 6 months (better if a year of more). After undergoing all that heat stress, the manure will remain nutrient-rich and won’t smell. Harmful pathogens should be killed off naturally although some experts contend that disease organisms could remain over time if not composted. HOW DO I AGE MANURE? 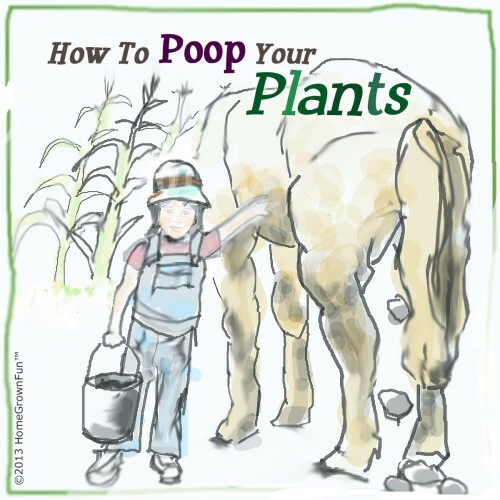 You can let the manure sit alone in a safe place (away from water runoff or human and pet interaction), or pair it with carbon-rich materials like straw, shredded paper or leaves. The sun’s heat and the manure’s high nitrogen content will “toast” the poop well. Leave it to roast for at least 6 months and make sure it’s no longer stinky or moist. 4. Compost in a Pile and Go the Extra Mile! Fresh manure breaks down well in a compost heap. If you want a good amount of composted manure and don’t have the land for a compost heap, you can purchase aged and composted manure. If you compost it yourself, once the compost is finished, let it cure for 2-4 months before using it in your garden – the longer the better (6 months or more). CAN I ADD MANURE TO MY COMPOST TUMBLER? Compost experts give the “o.k.” that adding a little bit of manure to your well-balanced compost tumbler will help heat up the material and speed the composting process. But the best method for composting manure is in a outdoor pile. In other words, unless you know your composter or tumbler can turn poop over properly, don’t add more than a cup of it to a small, enclosed space. WHAT’S THE DIFFERENCE BETWEEN AGING AND COMPOSTING? Composting and aging are similar. They both heat up the poop to kill bacteria, reduce density and eliminate stench. Aging can be done without composting. 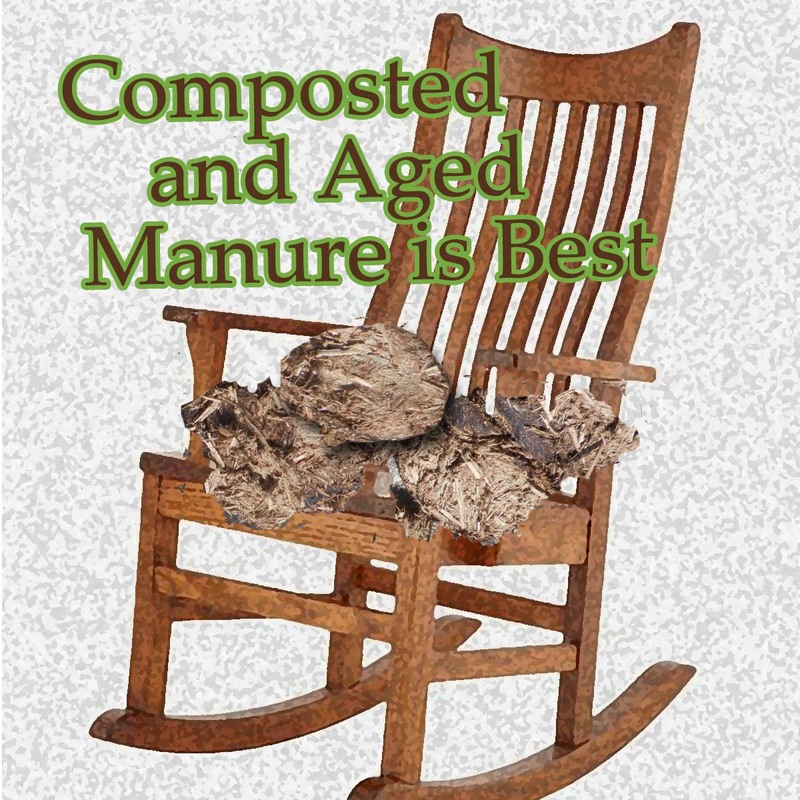 The manure doesn’t need to be mixed with carbon-rich items to age (but most likely is mixed with bedding like straw or other materials used to absorb odors or cover up the muck). Many folks do add straw, leaves or the like to manure to age it and these same combinations work well to compost. Both methods make it easier to handle and apply uniformly. 5. Apply it Like a Pro! Dilute it, don’t pollute It. Work it in way before harvest. Keep it clean. Apply aged or composted manure to your edible garden 90 days prior to harvest if the produce will not come in contact with the soil. Apply 120 days in advance of planting root crops. Never sprinkle it on top of plants, especially lettuce and other leafy greens. It’s NOT recommended to apply aged or composted manure near the roots of tender plants, at the beginning of the planting season and especially not to edibles at planting time. Use it as a side dressing? Not so much. DILUTE IT, DON’T POLLUTE IT! Water manure in thoroughly versus throwing it on top of the soil. A more effective way to apply manure, once aged or composted, is to mix it with a good quality compost. Make your own manure tea or buy muslin bags of aged manure developed for manure tea. Manure tea has been shown to aid the growth of vegetables, fruit, flowers and ornamental plants, trees and shrubs. See the next paragraph for more information on how to make manure tea. Many folks soak their bare root roses in a diluted manure tea solution made with aged/composted manure and water. Place some aged or composted tea in a nylon stocking and tie the end. Stick it in a 5 gallon bucket and fill with water. Soak your bare root plant in it for a day. Soaking seeds in a highly diluted manure tea prior to planting has also become popular. There’s an ongoing debate in the gardening world about whether non-aerated compost teas are safe. If the manure compost is considered safe, then compost tea made simply with water and left to sit for several hours to a couple of days should not develop new, harmful bacteria. The topic of aerated vs. non-aerated compost tea brews is too much to tackle in this post. To be safe, keep fruit and veggies up off the ground in soil that has been amended with aged or composted manure. Non-woven, rubber/vinyl gloves and boots are probably the best defense to preventing sickness from E. coli contamination. But make sure to wash these items thoroughly and clean your hands well after you’re done handling it. Always wash veggies and fruit before serving. How do the various manures stack up? Once composted or aged, manures lose some of their nitrogen content. Before they are composted, they are considered “HOT”. This means they contain loads of urea nitrogen that can burn plants’ roots. Some manures are hotter than others. This would make a funny cartoon, don’t you think? Knowing the nutrient strength of a particular manure can help you match it to the plants you’re growing. WARNING: Never use human, cat or dog manure or any manure from a meat eater. If your local zoo offers up some lion poop for free, kindly pass. Lions may be kings of the jungle but not the home garden. 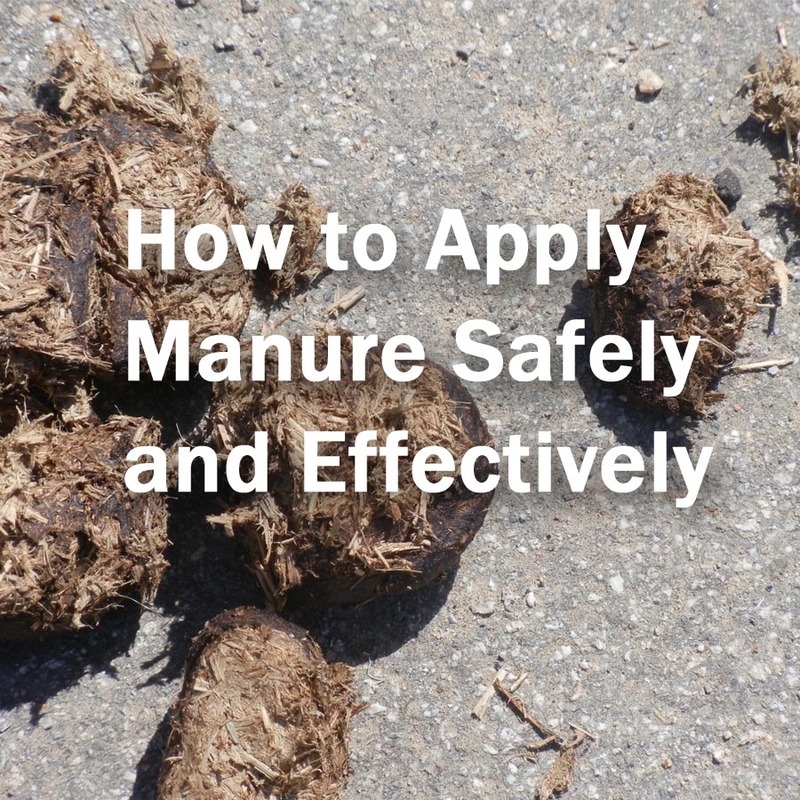 Fresh chicken manure packs a powerful nitrogen punch, almost twice that of horse manure. One aged and/or composted, use it sparingly in areas where you’ll be growing crops that flower because loads of nitrogen may produce loads of leaves and you’ll be left wondering why you didn’t get any blooms or fruit. Corn craves nitrogen and is a good match for poultry poo. An average-size hen makes 1 cubic foot of manure every six months. Wow! Cow manure has the least amount of nitrogen but my preferred manure because it’s easy to find and the least likely to burn plants or over fertilize and stunt flower or fruit development. Rabbit manure is less smelly as other manures. It’s higher in nitrogen than sheep, horse, chicken and cow manure. Its phosphorus content is wonderful and this type of manure suits flowering and fruiting plants. Horse manure is rich in nitrogen but lacks phosphorus and potassium so it’s not the best choice for flowering plants, tomatoes or peppers. Use it instead on leafy plants, ornamental plants and lawns. But remember that it should be aged or composted for use with edibles. 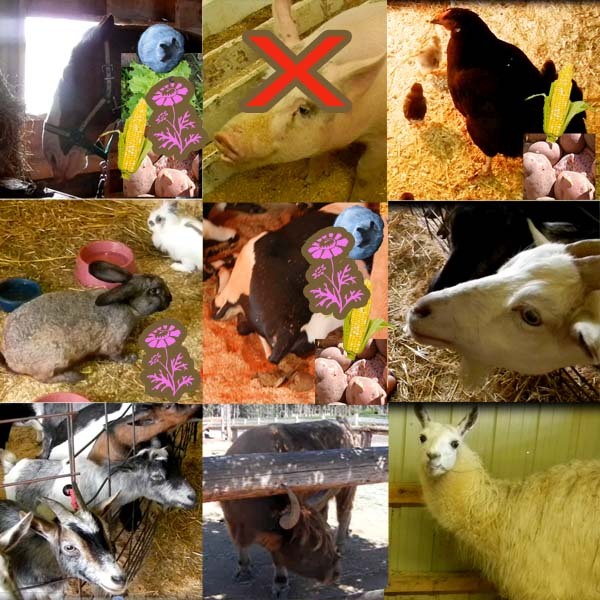 Corn, potatoes, garlic and lettuce would benefit from soil amended properly with well-aged or composted horse manure. Sheep manure is probably a better manure compared to horse manure because it contains potassium. People comment that it smells less than cow or chicken manure but it takes longer to dry out. Pig manure is a non-starter. It’s problematic. Although it has loads of nitrogen, it contains awful strains of bacteria and the nitrogen it does have releases so slowly, it’s not worth the risk or trouble. Do you want to learn how to make your own organic fertilizers from materials you find around the house! Get our popular 200 page eBook with over 140 images and 50 recipes, you’ll be feeding your soil and your plants same day! No complicated equipment needed. Click on the image to see the long list of topics and materials in the eBook. Grow your own loofah sponges with video! How-To Make a Hypertufa Planter, Trough and Sculpture!